Major players working in the global pruritus therapeutics market comprise Amgen Inc., Allergan Inc., CARA Therapeutics, Astellas Pharma Inc., Teva Pharmaceutical Industries Ltd., Novartis AG, Abbot Lab, Ajanta Pharma ltd, Galderma, and GSK. These players will take the global pruritus therapeutics market to new heights in the years to come. 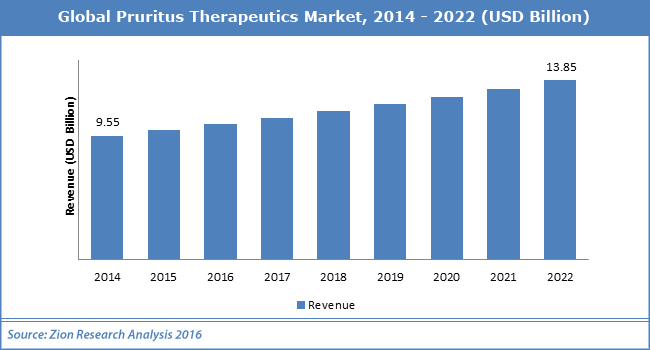 As per analysts at Zion Market Research, the Global pruritus therapeutics market was capitalized at USD 9.54 Billion in 2014 and is likely to cross USD 13.83 Billion by 2022, developing at a CAGR of 4.8% from 2016 to 2022. Skin disease is the 4th top reason of nonfatal disease burden. Skin diseases comprise psoriasis, eczema, pruritus, acne vulgaris, decubitus ulcer, alopecia areata, scabies, urticaria, impetigo, fungal skin diseases, abscess, cellulitis, bacterial skin diseases, molluscum contagiosum, viral warts, and non-melanoma skin cancer. Hence, pruritus therapeutics market is developing with increasing prevalence of skin diseases, as per analysts at Zion Market Research. In addition to this, the introduction of new products and patent expiration of dermatitis drugs are also accountable for the development of pruritus therapeutics market in the years to come. On the other hand, lack of awareness about pruritus might hinder the development of pruritus therapeutics market in the coming years. Nevertheless, increasing number of patent expiry and untapped market of pruritus drugs might unlock new avenues for the pruritus therapeutics market in the forecast period. Moreover, various R&D activities by market players as well as government and academic bodies will augment the development of pruritus therapeutics market in the forecast period. For instance, in April 2018, Menlo Therapeutics declared results from a stage 2 test of serlopitant for pruritus linked with atopic dermatitis. Menlo Therapeutics Inc. is a late-stage biopharmaceutical firmed aimed on the making of serlopitant for the curing of refractory chronic cough and pruritus linked with different underlying dermatologic cases. On the basis of region, the pruritus therapeutics market has been divided into Europe, North America, Latin America, Asia Pacific, and the Middle East & Africa. North America ruled the pruritus therapeutics market with over 40% share and it is likely to develop at almost CAGR of 5.0 % in years to come. Europe is the second biggest area in pruritus therapeutics market and is likely to show significant development in the years to come due to elevating occurrence of skin diseases. Asia Pacific is planned to witness the quickest development in the coming years in pruritus therapeutics market and this is due to increasing government support and rising awareness towards healthcare.